The best-selling author of Stiff: The Curious Lives of Human Cadavers now trains her considerable wit and curiosity on the human soul. What happens when we die? Does the light just go out and that's that—the million-year nap? Or will some part of my personality, my me-ness persist? What will that feel like? What will I do all day? Is there a place to plug in my lap-top?" In an attempt to find out, Mary Roach brings her tireless curiosity to bear on an array of contemporary and historical soul-searchers: scientists, schemers, engineers, mediums, all trying to prove (or disprove) that life goes on after we die. She begins the journey in rural India with a reincarnation researcher and ends up in a University of Virginia operating room where cardiologists have installed equipment near the ceiling to study out-of-body near-death experiences. Along the way, she enrolls in an English medium school, gets electromagnetically haunted at a university in Ontario, and visits a Duke University professor with a plan to weigh the consciousness of a leech. Her historical wanderings unearth soul-seeking philosophers who rummaged through cadavers and calves' heads, a North Carolina lawsuit that established legal precedence for ghosts, and the last surviving sample of "ectoplasm" in a Cambridge University archive. 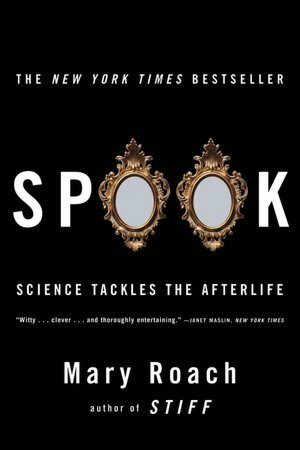 In Spook: Science Tackles the Afterlife Mary Roach investigates what happens after we die with the same entertaining style and humor found in her other books. The subject of life after death is explored in both scientific and unscientific ways. Roach writes, "Flawed as it is, science remains the most solid god I've got. And so I decided to turn to it, to see what it had to say on the topic of life after death. (pg 12-13)"
Spook includes a bibliography. Subjects explored in the twelve chapters include: reincarnation, searching for the soul with microscopes, how to weigh or see a soul, ectoplasm, mediums, communicating with the dead, electromagnetic fields, searching for ghosts, and near-death experiencers. Roach approaches the exploration in a random light hearted manner. It's by no means an exhaustive in-depth exploration. Her goal clearly is to entertain the reader while conveying some information on the various topics. "Simply put, this is a book for people who would like very much to believe in a soul and in an afterlife for it to hang around in, but who have trouble accepting these things on faith. (pg. 14)"
Of the three books by Roach I've read, Stiff, Packing for Mars, and Spook, I'd have to say that I enjoyed Packing for Mars and Stiff more than Spook. Based on that comparison to other books by Roach, Spook is recommended. New readers will perhaps want to start with one of her other books first while fans will want to read this anyway. The deeper you investigate a topic like this, the harder it becomes to stand on unshifting ground. In my experience, the most staunchly held views are based on ignorance or accepted dogma, not carefully considered accumulations of facts. The more you expose the intricacies and realities of the situation, the less clear-cut things become.